Beautiful, heart-wrenching performances from the townspeople. Excellent performance from David Oyelowo. Infuriating performances from Tim Roth & Tom Wilkinson, which was good, because they were supposed to be. A near perfect script. There was a line where Coretta Scott King (Carmen Ejogo) said something about “the fog of life” or something, and it was kind of cheesy. It was supposed to be heartbreaking moment, and it would have been, had the line been said 20 years ago. But it’s 2014, and variations of the line have been said so many times that now it’s just cliché. But other than that one line, it was perfect. It’s sad to me that the one film this year with the most diverse cast is a film about civil rights. Pretty much every other film this year could have had a black cast in the leading roles, instead of being relegated to the villain or, worse, extras with no lines. The camera movements on MLK (David Oyelowo) were excellent. There was a scene where MLK and LBJ were conversing and behind them, center-frame was a picture of President George Washington; it was a very ingenious scene. The incorporation of actual photographs from the Selma march was poignant and powerful. I wish some of the music during scenes with no dialogue had been louder. It would have helped pick up the pace a little. Otherwise, a very excellent score. And “Glory” by John Legend and Common better win Best Original Song; it’s easily the best of the lot. With my limited knowledge of the 1960’s (photographs), I think the costumes and hair were perfect and really helped recreate the atmosphere. Under normal circumstances, this would be an important film. 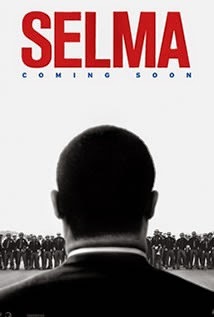 But given what has transpired this year in Ferguson, I would say that it is the most important film of the year. It felt a bit slow at the beginning, but that’s to be expected with historical and biographical films, so it doesn’t count against it. Sometimes important films can get a little full of themselves, but this one didn’t at all.